Irritable bowel syndrome, or IBS, is a condition that can be hard to cope with. However, more sufferers are discovering the natural yet effective effects of essential oils for IBS. The bowel of a person who suffers from IBS is different from that of healthy individuals. While research into this bowel dysfunction is ongoing, we do know that certain stimuli in the bowel can activate areas of the brain that are associated with pain and discomfort. This is what people who suffer from IBS go through. High levels of stress have been linked to triggering IBS symptoms and using essential oils has been known to help improve these symptoms in some people. 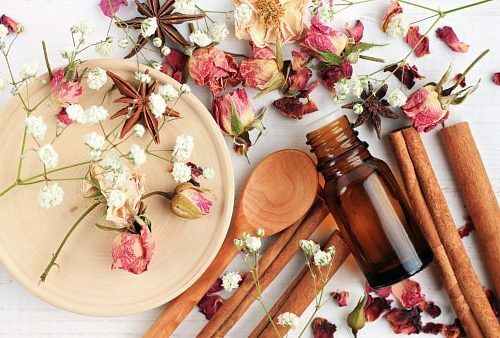 If you’re struggling with the symptoms of irritable bowel syndrome, think about the 9 essential oils for IBS that we outline here. Is It Safe to Use Essential Oils for IBS? When it comes to using essential oils for health purposes, the question of safety is always at the forefront. The National Association for Holistic Aromatherapy has stated that most essential oils are “generally safe.” It is important to note that in some cases, essential oils can cause irritation or even minor discomfort. While the U.S Food and Drug Administration (FDA) doesn’t currently regulate the use of essential oils, many individuals promote the use of essential oils for IBS based on the fact that they have personally experienced symptom relief with them. It is important to learn how to use essential oils for IBS properly. Often, the use of essential oils comes down to personal choice. For example, some people prefer one fragrance to another fragrance. Here’s a list of what we understand are some of the best essential oils for IBS. This is an oil with powerful anti-inflammatory as well as antispasmodic properties. It’s also considered a pain reliever. Cumin essential oil can help stimulate gastric juices to speed up digestion. In one study, this oil was found to be especially effective for those who suffered from IBS constipation. Thought to be one of the best essential oils for IBS, peppermint oil has antibacterial and antifungal properties and can help improve symptoms of stress. Since it also has antispasmodic qualities, it’s one of the best essential oils for IBS. In terms of how to use peppermint oil for IBS, most people take it in the form of a capsule. It is wise to make sure the peppermint capsule is enteric-coated and that you take it just before a meal to avoid heartburn. Some people add one drop of it to a cup of herbal tea but it is best to consult a healthcare professional before consuming the oil. Research shows that the active ingredient in peppermint oil (menthol) has calcium channel blocking properties that are believed to help the colonic smooth muscle. This oil can be effective in soothing pain in the intestinal tract. It is antiseptic, antibacterial, and has anti-inflammatory effects. Some people add it to recipes but you do have to use it carefully because it can stimulate appetite. Many ginger essential oil users add two to three drops to a warm bath and soak in it for 20 to 30 minutes. This oil can disinfect and kill bacteria that can impact the gut. It also acts as an antispasmodic and helps release trapped gases that cause abdominal discomfort. A very popular essential oil, lavender oil has an antimicrobial impact, so it can help with digestive issues. It also seems to contain pain-killing effects. Some tests suggest that lavender essential oil can help prevent the growth of germs and certain types of bacteria, such as E. coli. This is another strong antibacterial and antifungal essential oil that can help the digestive tract. It is known for being able to address symptoms of gas, cramping, and diarrhea. Here’s how to use frankincense for IBS: dilute one drop in a teaspoon of honey or in a glass of water and take it orally. Used for centuries as an aid for those who are suffering from abdominal problems, oregano essential oil tends to act the same way as anti-spasmodic medications by calming gas and bloating. Oregano oil can be added to a hot bath or herbal tea. Anise is a Mediterranean spice that has been used for many years as a digestive aid. The seeds taste a lot like licorice. Anise essential oil has been known to help with bloating, gas, stomach pains, and diarrhea. Anise oil can be added to herbal tea. This is a combination of lemon, rosemary, eucalyptus, clove, and rosemary essential oils. Together, this creates a strong antioxidant oil blend. Many people with IBS add a few drops into a vegetarian capsule and swallow with a glass of water. Some people find it hard to know where to start when choosing essential oils for GI problems. It can be helpful to review essential oil recipes. The following are examples of recipes for using essential oils specifically for IBS symptoms. Mix the oils and shake just before use. Apply the oil to the stomach in a clockwise massage pattern two to three times a day. Mix together and apply the blend to your stomach and lower back right after you have eaten. Blend the oils together and keep the container in a dark, dry place. When using, shake well and apply about eight drops on the stomach and back. Blend the oils and keep the container in a dark, dry place. Shake well and apply a moderate amount to the stomach and massage into the skin. Blend together and apply a moderate amount on the stomach and back. Apply as many times as you like. Mix the Epsom salt and the essential oils in a hot bath and soak for 15 minutes or more to help reduce abdominal pain. Research shows that a significant number of both children and adults with gastrointestinal and IBS-like symptoms use alternative approaches to address those symptoms. A lot of the pain and discomfort associated with the abdomen has been linked to the “brain-gut axis” as described earlier. There is some belief that antidepressants that reduce pain perception as well as boost mood can improve the GI tract and that some essential oils act the same way. If you plan on trying essential oils for IBS, consider talking to a qualified aromatherapy expert and your doctor first. This is especially important if you’re taking any medications.